It’s that time of the year again. The ending of a very confusing, to say the least, year and the hopeful beginning of a new year with new opportunities, experiences and 365 unwritten days. How wonderful. Before we start the wonderful journey that 2019 is going to be, it is best to look back and see what we’ve learned from all our 2018 experiences. To see which ones we should definitely not leave in 2018, but instead take with us to 2019. I will be sharing the 18 lessons I learned in 2018, as I did 16 in 2016 and 17 in 2017. It’s only fair to continue the tradition. Note: the 18 life lessons I learned in 2018 is a long read so get comfortable! 1. Be grateful for being alive in this day and age. I have come to realize that being alive not only is a miracle (for you know, all the obvious reasons), but being alive in this day and age is even more miraculous. Basically everything we need can be acquired with the push of a button. The access to information, help, entertainment, you name it is endless. The possibilities of what we can do in this day and age continues to stun me. 2. I’m richer than I think. No I’m not talking money. I’m talking love, experiences and family. Having a roof over my head, food in the fridge/pantry and also money at the bank. I know I said I didn’t mean money and I stand by that. Being rich is not just having billions at the bank, all the things I mentioned before are things some people do not even have access to on a daily basis so yes I, hopefully we, am/are richer than I/we think. (What a sentence!). 3. One decision can literally change your life. I decided to start living a life I love and slowly but steadily things are starting to fall together. For those of you who have been with me since day one or are aware of how 2018 was for me might be surprised to hear me say that things are falling together, however I have a good feeling that they are. Also it’s not just deciding that will change your life. You also have to get to the doing part of your decision. Seriously. STOP WAITING. The time is never going to be right, the money to be ‘’free’’ as in not destined for anything else or for you to be ready. The perfect time to do anything is today, now and this moment. There’s also no such thing as a special moment. Being alive is your special moment! By waiting the only thing you are letting happen is that you are letting life pass you by without having written a story you love looking back on! Don’t do that! Pretty Please! 5. Life has a tendency to work itself out exactly how it benefits you the most. By benefits I mean for you to live your best life. This one was and is a hard pill to swallow. The less we intervene and the more you trust your intuition to guide you the less stressed you will be. I have withstood great stress trying to suppress my urge to intervene and make things ‘’right’’’ but everytime I didn’t and just let things happen, although with stress levels through the roof, everything worked out exactly as I wanted to. 6. Stop sweating the small stuff. My greatest annoyance of myself is going to the store coming home and realizing I forgot something even though I made a list. Know that in a week I won’t even remember what it was I had forgotten or why I was in a bad mood, unfortunately the people around me usually do though.. Seeing that it doesn’t really matter, as I had forgotten within a week, why sweat it? This goes for so so so many things in life. Most of which at the end of day are not even of that great importance. I now always think there’s a reason why I forgot and it has to do with point number 5. 7. Look at the world with eyes of love, adoration and respect. You know how they say what you focus on you will see? So focus on finding the positive in life. I know walking around with rose colored glasses is deemed as dangerous but I assure you it is not. It is more a case of taking your head with you while you make your experience of your day to day more positive, pleasant and wonderful because the world truly is a wonderful place. Nothing like a great view to give you some perspective. Photo taken in Marbella. 8. Relentlessly do what is best for you. Granted I learned this one the hard way. Doing what is best for you includes your health physical and mental, peace of mind and guarding your smile. There are many things people say we should do but I believe this is the one perhaps only one that we really should be doing. I had to learn the hard way that I have to listen to my body, my heart and mind so now I make no exceptions in doing what is best for me. Mind you though I am not purposefully hurting and/or harming anyone. That is bad, no matter the reason. 9. Do not follow what you think is right, follow what you feel is right. Very much tied with point number 5. The feeling within is usually right. Do what feels right even if that looks strange to others or your head is putting up question marks. Learning this has served me well on numerous occasions. 10. Do not let people convince you of being entitled to know everything about you. Knowing what is going on is your life is privilege they have not a right. I have learned that it is up to me what I share and with who I share what. In this social media oversharing decade it seems absolutely normal for people to know every last detail about you. Guarding your privacy seems like a rebellious act. Even though it is absolutely not.. really. 11. Stop engaging with people who you don’t like. Stopped by the side of the road somewhere to take this photo! 12. You are the only one who can save you from any situation. Other people can definitely help you, they however cannot save you. Saving you is up to you. Making sure that your entire life goes as planned is all and solely in your hands. Becoming your own hero is a must. 13. Learn how to use your voice. Along with being my own hero, my voice can save me a lot of headaches. All I have to do is speak up. Speak up when things are going wrong and speak when things are going right. Yes speaking up in both situations is important because it is the only way to let my surrounding know what I like and/or don’t like. I also learned that this works best in the moment itself and not days after when I am finally done beating myself up for not saying something when it was happening. 14. When an opportunity presents itself, no matter how crazy, take it. Your life can change within a second. The opportunity may never come around again, so take it while it is in front of you. Even when it seems to come at the worst possible moment. Remember that there is no such thing as the right moment because this is life and life is fluid. So fluid it can change within the second and your life can look completely different. Trust me on that. Do not create moments to where you look back thinking ‘’I wish I did’’ create moments that when you look back you say ‘’I can’t believe I did that’’. Started the 2018 adventure in Disney! 15. Give yourself time to process the hits you’ve taken. Again this is life and in life things happen. Bad things. It’s okay to cry, to feel sad and/or to be upset. In those moments give yourself what you need. There’s absolutely no reason to be an emotionless person because you are not. Sometimes things are better overnight sometimes it takes a little more time and/or a little more (emotional) work and both are perfectly okay. 16. Always believe that the best is yet to come. Because what reasons do you have to believe that you have already lived your greatest moments? You are the greatest project you’ll ever work on so invest in yourself. Invest in everything that will enrich your life story. Do note that does not, by far, mean material items. A classic but very true. If you have more than one dream make sure to make ‘m all come true. Maybe not at the same time because we still only got 24 hours in a day but, you know, use your time to make your dreams come true and live your best life, however that may look like. And that’s all folks, The 18 lessons I learned in 2018. 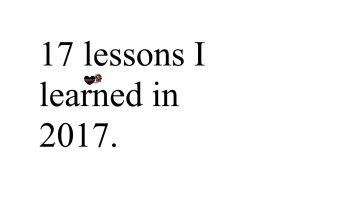 I’ll also still be applying the lessons I learned in 2016 and in 2017 because we are continuing the story. Remember there are only two reasons to look back to see how far you’ve gotten and/or to see what we’ve learned to do better in the future. What are the 18 lessons you’ve learned in 2018?